An ideal choice for quicker and easier vehicle wraps, ORAJET Series 3951Professional Wrapping Film with Rapid Air ® features an advanced air release system, a grey-pigmented solvent-based repositionable adhesive and cast construction for highly conformable performance over the most difficult curves, corrugations and rivets. 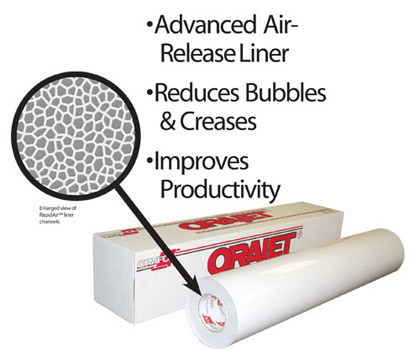 ORAJET 3951RA features an ultra-glossy surface to produce vivid, life-like prints that can be removed with no adhesive residue for up to four years. Recommended for use with ORAGUARD® 290 laminating film.